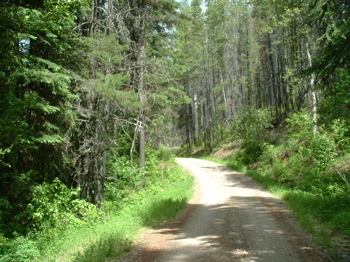 Inside North Fork Road at Glacier National Park. I ended yesterday’s post in the middle of a story of how God lead me through the voices of others and events in my life to run my own business and start this website. Where I left off, my wife and I both found ourselves unexpectedly unemployed with a great deal of financial responsibilities and a toddler to support. Interestingly, we were in very high spirits that day and found ourselves laughing with joy over the situation. I’d like to say it was because our faith was so strong that we knew, without doubt, that everything would work out. I know that our faith helped, but I believe there was also a nervousness and uncertainty in our laughter. But, we carried on as if we knew everything was going to work out, and it has. The business associate I wrote about yesterday, who I reluctantly decided to work for earlier this year is now my largest customer and is providing the base funding to grow the business. My wife, whose business skills are far superior to my own, is now the business manager of our new business. Today, I believe that she will play an unexpectedly integral roll in the future success of our business. Having my own business has given me the flexibility to maintain this site which has had the side effect of increasing the search engine rankings of my business site, and most of all, has given me the opportunity to express my gratitude to God by being of service to others. What is the Purpose of Be Inspired Every Day? For a while, I had wondered exactly what the deep, spiritual purpose of this site is. There are a thousands, maybe millions, of personal development and spiritual growth sites on the web. I have a small, but loyal and slowly growing, readership. The words that I speak, though I believe they are deeply meaningful, are not wholly unique. The lessons God has taught me in life are not unlike those shared by many others. What had recently occurred to me is that, my decision to significantly change the direction of my life did not come from the suggestions of a single source. It was the reinforcement of God’s message to me from multiple voices including Steve Pavlina, Dr. Wayne Dyer, Steven Covey, Viktor Frankl and others including a few people in my personal life. There was a string of circumstances and messages that brought me to where I am today, that has accounted for the rapid success of my business and that has made this website possible. I know now that for many of you, this site is a piece of the puzzle of God’s voice in your life. I am one of many who has been lead by God to reinforce his message and provide a tiny voice, that when combined with many others, contributes to the powerful voice of God we read about in the early religious texts. If you are not sure of your purpose in life, or what God is calling you to do, open yourself up to the small voices, whether they are church leaders, friends, bloggers, events, etc., and you will hear His voice when you are ready and willing.